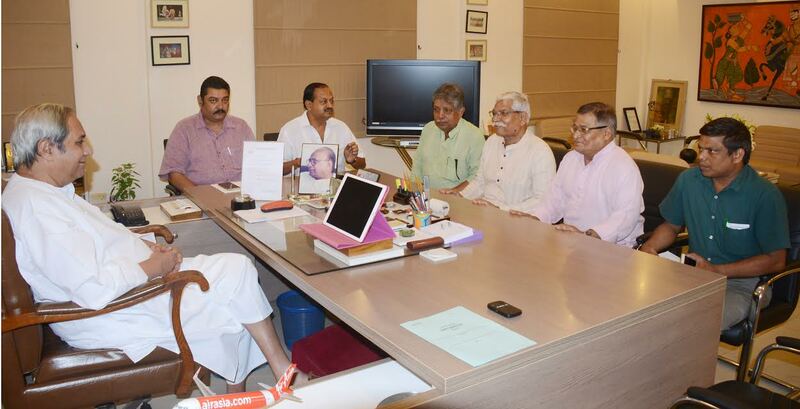 If the Chief Minister is sincere in his approach, one may call it the first positive step towards governance of Orissa in Oriya; as on being invited by the Chief Minister, Bhasha Andolan leadership comprising Subhas Chandra Pattanayak (Chairman), Pradyumna Satapathy (President) and Pabitra Maharatha (Convener), met him in an exclusive discussion in his Secretariat chamber at 6.30 pm on Friday. Former Minister Debi Prasad Mishra, who, as Chairman of the Ministerial Committee, had the greatest role in making the Government accept the first part of the advice, which SCP had given as a member of that Committee and in, consequent upon that, in inserting section 4 in the Orissa Official Language Act, 1954, paving thereby the way for formation of Rules to drive the Act ahead under the new section, facilitated the discussion. Minister Prafulla Samal and Spokesman of the ruling party, MP (Rajyasabha) Pratap Dev were present. “The State Government may, in such manner and by such authority, as may be prescribed in the Rules made under this Act, receive complaints from general public of Orissa in matter of contravention of the Act, and over and above such complaints, suo motto review and monitor whether the directions contained in the Notification under Sub-Section (2) of Section 2 are contravened and subject the contravener to punishment stipulated in the Rules”. 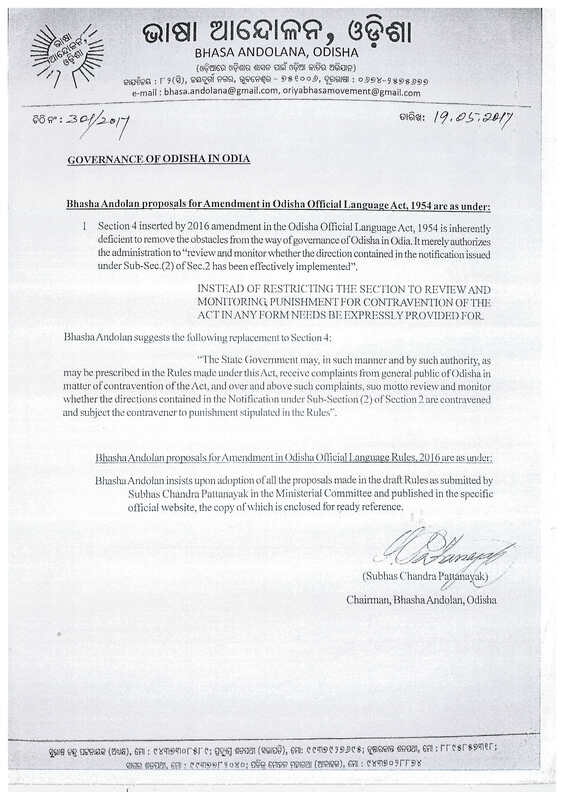 According to Bhasha Andolan, the Orissa Official Language Rules, 2016, created on basis of the new Section-4 is of no consequence inasmuch as working of the Act is left therein to the mercy of the habitual contraveners of the Act. In their written memorandum, given on the table to the CM, its leadership emphasized that, it “insists upon adoption of all the proposals made in the draft Rules as submitted by Subhas Chandra Pattanayak in the Ministerial Committee and published in the specific official website”. Bhasha Andolan shall continue with its Black Flag Campaign till punitive provisions are made in the OOL Act and its Rules, the leadership decided. BE IT BE EQUALLY an IMPORTANT Milestone Achievement in the process THAT YOU COULD HAVE THE HORSE’S EARS STOOD-UP LIKE ANTENNA FOR THE PURPOSE, nonetheless. However, this meet is a must booster for the ‘ BHASHA-ANDOLAN ‘ IN THE RIGHT DIRECTION, for sure. Tomorrow is going to be another-DAY. in my view along with punitive measures in Odisha Official language act 2016,we should demand for a proficiency test for non-Odia bureaucrats, compulsory use of Odia language in lower courts of Odisha. Make Odia language compulsory up to graduation level. Open a Odia language University(deemed).Conduct UPSC(Union public Service commission),OPSC(Odisha public service exams),OSSC & OSSSC examinations in Odia language .Increase age limits in all state govt jobs from 32 yrs to 40 yrs as unemployment is acute.Appointment of Odia teachers in all govt schools & colleges.All the signboards ,hoardings ,bills,prescription should use Odia language without any delay.Development of a common Odia software so that all the communication in Odisha administration can be done in Odia language.The mode teaching/communication in all the model schools of Odisha should be in Odia language. Odisha govt should introduce domicile policy,language policy,employment policy in our state. Introduce LLB,BA,Bcom,Bsc courses in Odia language. recruitment process.They are manipulating the recruitment process to satisfy their ugly need .Please refer to the Samaj dated 21.05.2017 Bhubaneswar edition(Page-11). leader who can guide us by example. Odia Loka Charitra have changed a lot ,so getting united for a cause in Odisha is very difficult.Delhi govt or Odisha govt will listen to us only when we will show the same reaction ,shown by Kannadigas in Kaveri water issue.Otherwise we will gradually loose our river,land mass,mines,minerals,language within very short period of time. Bhasha andolan means Mukti andolan from foreign rules, Let all sons of the soil understand it and join Bhasha andolan. No one is greater than the mother, motherland and mother language.